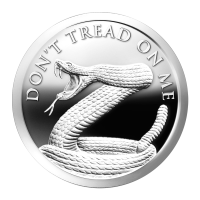 Disco in argento proof-like 1 oz 2014 Don't Tread on Me "Don't Tread on Me" has been the slogan of the downtrodden for centuries, but never more famously than when the US used it in their fight for freedom. This newest design from the Silver Shield series captures that idea perfectly, but also in a striking way that is not commonly seen. Most of the snakes depicted along with the slogan seem small or almost worm-like. Not so with this design. It features a rattlesnake coiled and poised to strike. Not weak or languid but ready. This design by Heidi Wastweet perfectly captures the idea embodied by "Don't Tread on Me". It is not the whine of the enslaved, but rather a warning from the patient patriot, biding his time, but ever watchful. This design is sure to be a favourite among collectors. This timeless slogan is forever immortalized in a 999 pure silver round.